Details relating to the Andorran Commemorative of 2017. The coin is a celebration not of any specific event but of Andorra itself. The motif is very simple – in the upper half of the inner circle is a triangle formed of three wavy lines. This vaguely resembles the shape of Andorra and is the registered trademark of the Andorran government. 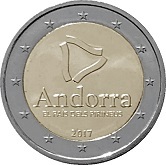 In the lower half of the inner circle is a bold inscription of the country of issue “Andorra” and thereunder the inscription “EL PAÍS DELS PIRINEUS” (The Pyrenean Country). At the bottom is the year of issue – 2017. Note: Although only issued in February 2018, this is in fact an Andorran Commemorative of 2017.